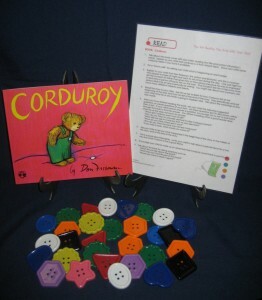 Corduroy is a small stuffed bear who has been on the department store shelf for a long time waiting for a home. As soon as Lisa sees him she knows he’s the bear she has always wanted. Her mother refuses to buy him as she has spent too much money that day and that he was missing a button. The little bear goes on an adventure throughout the store that night looking for his lost button. The next day the little girl comes back with her own money that she had saved to buy Corduroy. She takes Corduroy home where he discovers what a real home is like. Activity—Use buttons for a variety of activities such as counting, estimating, creating and solving math problems, and sorting buttons.